Individual Commentary (pdf file). This book introduces a taxonomy of Apostolic ministries: Paul—Stage 1, Timothy—Stage 2, and Titus—Stage 3. Apostolic gift-mixes are explored for all three stages of apostolic ministry. Contextualization of Christian teaching into the situation in Crete is explored. This book is one of a series of Biblical leadership commentaries. Titus, Paul’s companion, is a stage 2 apostolic leader. 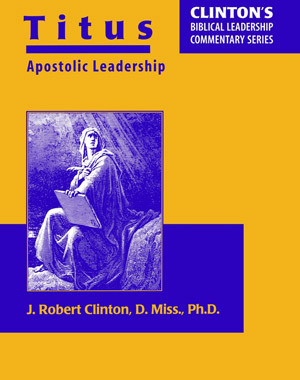 This commentary explores his apostolic ministry. It contains 49 leadership articles totaling 255 pages.